Many individuals with schizophrenia have problems with thinking skills, including attention, memory, and reasoning and problem solving. One of the main research focuses of the Woodward Lab is understanding the nature of these deficits. Ultimately, we hope that this work will lead to better therapies for treating psychosis symptoms. One of our key discoveries is that neuropsychologically-defined subgroups of patients exhibit different patterns of brain structure abnormalities. 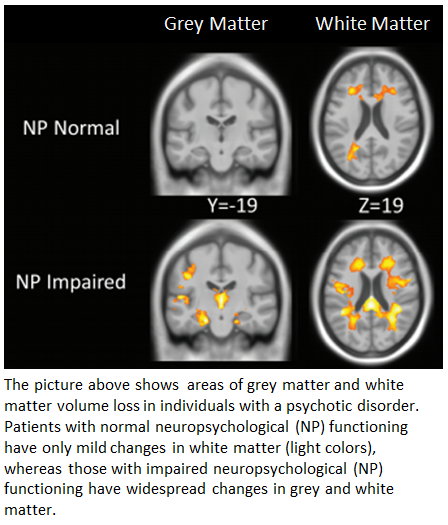 Patients with cognitive impairment demonstrate more extensive changes in grey and white matter than neuropsychologically normal patients. Moreover, some neuropsychologically impaired patients exhibit a pattern of brain changes characterized by reduced intracranial volume consistent with abnormal early brain development. Additional work by the Woodward Lab has linked reduced white matter integrity to slowed processing speed.